Festival 24 was unsurprisingly awesome, consequently many regular festival-goers are already enquiring about the 25th BMMF. It seems many people want to block off the dates for 2020. We have to make some plans. 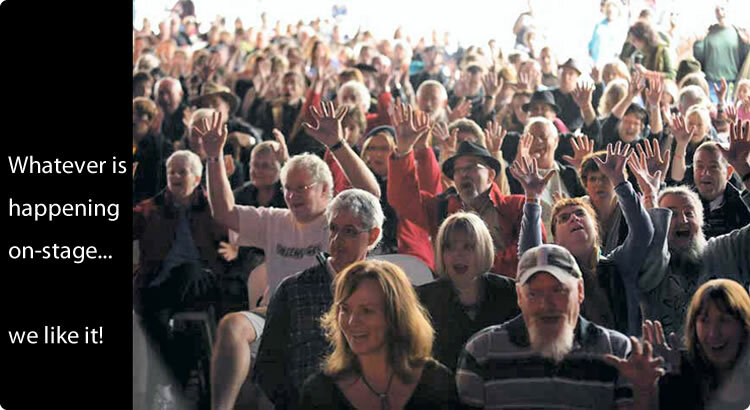 The Blue Mountains Music Festival of Folk Roots and Blues, takes place in Katoomba in March each year. It runs from 7pm Friday 'til late. Saturday 9.30am 'til late and Sunday 9.30:00am til 9:30pm. 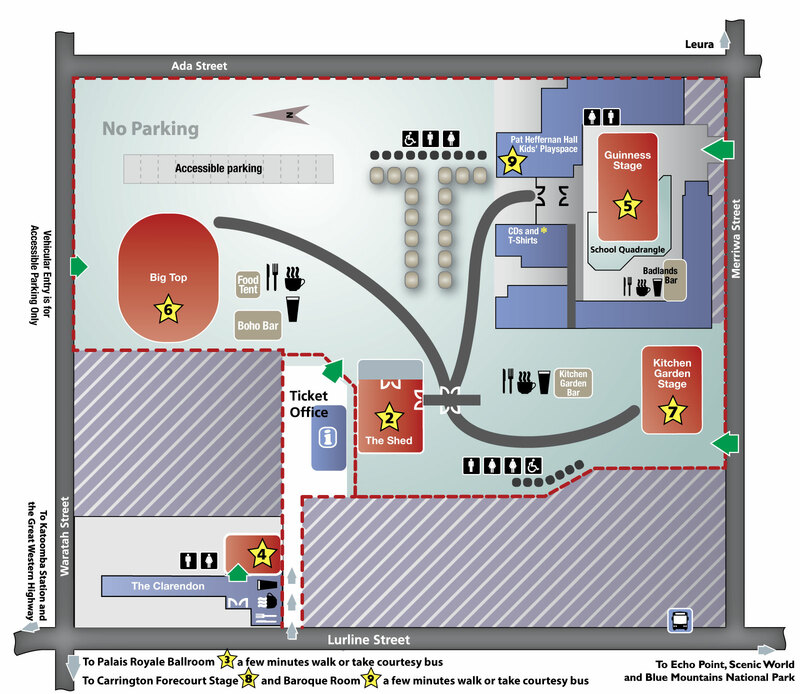 The festival site is home to 8 undercover performance venues (please see map for details) on which over 100 performances occur. All venues have seating, usually of the plastic, stackable kind of outdoor seating (except the Tantric Turtle which has cushions) which are comfortable enough for us, but if you bring a small cushion please do not use it for "reserving" a seat. Katoomba sits on the edge of a UNESCO World Heritage listed wilderness. It is the most visited town in the Blue Mountains and the world famous Three Sisters and the other panoramas and bushwalks are amongst Australia's most popular tourist attractions. A little to the west are the magnificent Jenolan Caves. Katoomba became known as a town in 1879 with the opening of a coal mine. The railway station was originally named The Crushers for its mining activity. The town is rich with architectural interest, with the Carrington, its grand Victorian era hotel, Art Deco 1920s boomtime buildings and scattered everywhere the much loved old miners' cottages and Federation bungalows. The huge choice of restaurants and cafes with some of the best coffee in the world hum with contented customers and a new surge of live music. Combine the scenic wonders with the best folk, roots, blues and indie music that the world has to offer and you may not want to go home. Some people don't. The box-office is located between the Clarendon Guesthouse and the school. 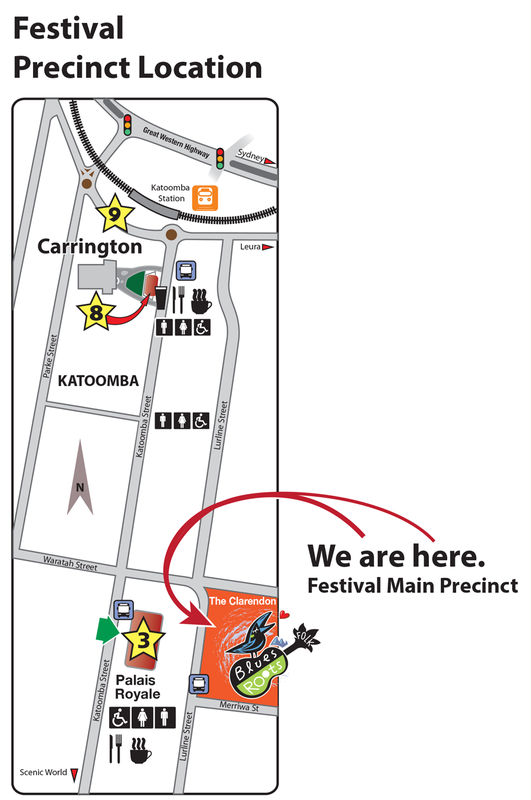 Access is from Lurline Street, at the end of the lane between the Clarendon and the RSL car-park or from the Festival car-park. By road Katoomba is 1.5 - 2 hours from central Sydney along the M4 and the Great Western Highway. It can sometimes be quite busy at weekends so if you are coming up on Saturday or Sunday leave early as you may need the extra . Trains leave from Sydney Central Railway Station for Katoomba almost every hour. Visit the Transport for NSW website and check-out the timetable for Blue Mountains line. Katoomba is a major tourist destination so accommodation and eateries to suit every budget are available. If you are planning to stay in the Blue Mountains for the Festival and need to book accommodation we recommend you make your arrangements well in advance of the Festival weekend. The festival site is compact and well planned - no more than a minutes walk from one stage to another, or 2-5 minutes walk to the many nearby cafes and restaurants. There are eight stages ranging from the intimate Clarendon Cabaret Room to the Big Top. A list of some of the various accommodation options in and around Katoomba, Leura and Blackheath from budget to 5 star. Award winning, comfortable, self-contained cabins and larger ecolodges adjacent to the National Park. Special accommodation packages, B&B, meals etc for the Festival weekend. Warmly welcoming and spacious rooms and suites with all the amenities you would expect from a 4 star resort. Indoor heated pool, free games room, tennis court, free Wi-Fi. Palais Royale Boutique Hotel, Katoomba - Palais is ideally located near the Blue Mountains Blues and Roots Festival and all the major attractions of Echo Point, Three sisters and Scenic World and walking distance to the eclectic cafes and shops of Katoomba. Heritage Guest Rooms & Rates: All featuring High ceilings, large windows and heritage styles bathrooms. These rooms are large and airy and starting From $120* for a Deluxe Single up to $290 for our Royal Spa Suite. For Bookings & Reservations contact 0247846300 or visit www.palaisroyale.com.au for more information. Dormitory, Double and Family Rooms available at great rates! Onsite we have a large fully equipped kitchen, BBQ Area, FREE Wifi, computer use and FREE Laundry facilities. On the cusp of the dramatic Jamison Valley in the World Heritage-listed Blue Mountains National Park, located only one and a half hours drive west from Sydney. The panoramic Fairmont Resort is the pinnacle of upscale accommodation in Leura, one of the most charming upper-mountains villages in Australia. Deluxe Accommodation in Wentworth Falls. The Falls Mountain Retreat is the Blue Mountains newest luxury hideaway. Hidden away in four acres of peaceful and secluded gardens on the edge of the National Park in Wentworth Falls, famous walking trails, waterfalls and breathtaking views are just a 200 metre stroll away. The Falls offers fully self-contained, serviced apartment style accommodation that is bold, luxurious and ultra modern—a stylish departure from the historic hotels, cottages and B&Bs for which the Blue Mountains are generally renowned. Poet's Cottage provides elegant Blue Mountains accommodation in historic Wentworth Falls, a quick 5 minute drive from Leura village. The stylishly restored 1912 cottage offers chic living with old-world charm. Self-contained, with plenty of pampering comforts, the cottage offers an open plan lounge and dining area, new kitchen and two bathrooms. The former home of a celebrated Australian poet who performed at our Festival, the Cottage combines a Blue Mountains cultural and historical experience with elegant luxury. All content on this website is copyright. No reproduction allowed without first negotiating permission with copyright owner.